New York City is home to the highest caliber of every genre of live performance imaginable. There are shows to be consumed and critiqued twenty-four hours a day, seven days a week across all five boroughs. Manhattan tends to hog the limelight, so it may come as a surprise that Bushwick offers some of the most exciting performances in the city. For Brooklyn dwellers who can’t bear the thought of traveling to Midtown to spend half a paycheck on a performance reviewed by The New York Times, Bushwick’s variety shows are an ideal alternative. Variety shows have been a source of entertainment since prohibition, but they’ve evolved from family-friendly musical and sketch comedy events to something a bit more radical. At Scarlett Cerise and Savannah Scrugg’s “Plan B! Variety Show”, which takes place every third Monday of the month at Bushwick’s Bizarre Bar, I witnessed burlesque performer “Ding Dong Daddy” complete his act with a baby bjorn, a track of pop hits mixed with infant cries, and a baby doll in tow. A few fan favorite variety shows in the neighborhood are run by women and gender non-conforming artists, a rarity in the male-dominated entertainment industry. I spoke with some of these hosts to learn about their shows and what it means to present queer, female-centric and idiosyncratic work. Scarlett Cerise and Savanah Scrugg are Bushwick-based artists, old friends and hosts of “Plan B! Variety Show” which will celebrate its one year anniversary on January 21st. Proceeds from each show (there is a suggested donation at the door) are donated to a charity of the hosts’ choosing. 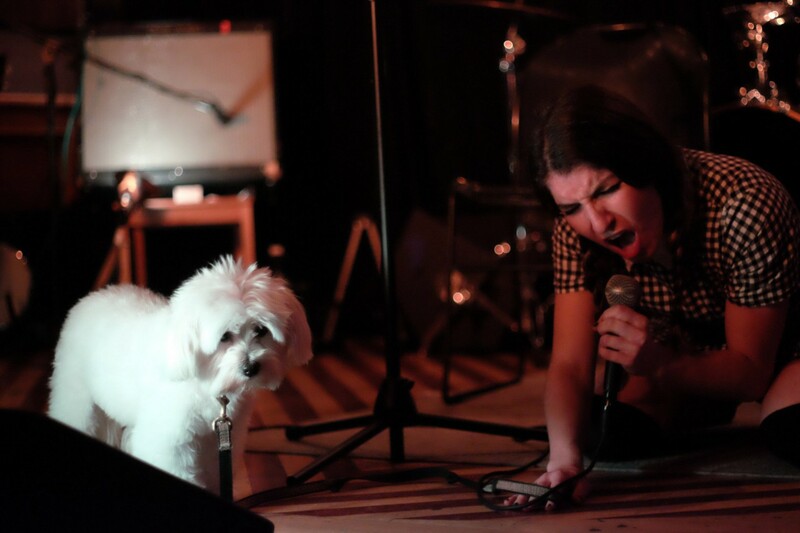 Featuring a myriad of performers and genres, it’s a perfect example of the unique live performance available to and made by Bushwick residents, and it’s sure to entertain even the most cynical audience member. Sarah Galante: How was “Plan B!” born? Scarlett Cerise & Savannah Scruggs: When two co-workers in a toxic corporate work environment love each other very much, they go to a dive bar and decide to create their own variety show. Plan B! was born out of the desire to do better. For ourselves, for the artistic community, and the larger community of Brooklyn. SG: You host your shows at Bizarre Bar in Bushwick. Tell me a little bit about why you chose this bar and neighborhood. SC & SS: Plan B! has been at Bizarre for its entire 12 month run! Bizarre was a natural choice for us because we were already participating in shows at the venue and we both live in Bushwick. Bizarre has become a home-away-from-home, and we are so thankful for that community. 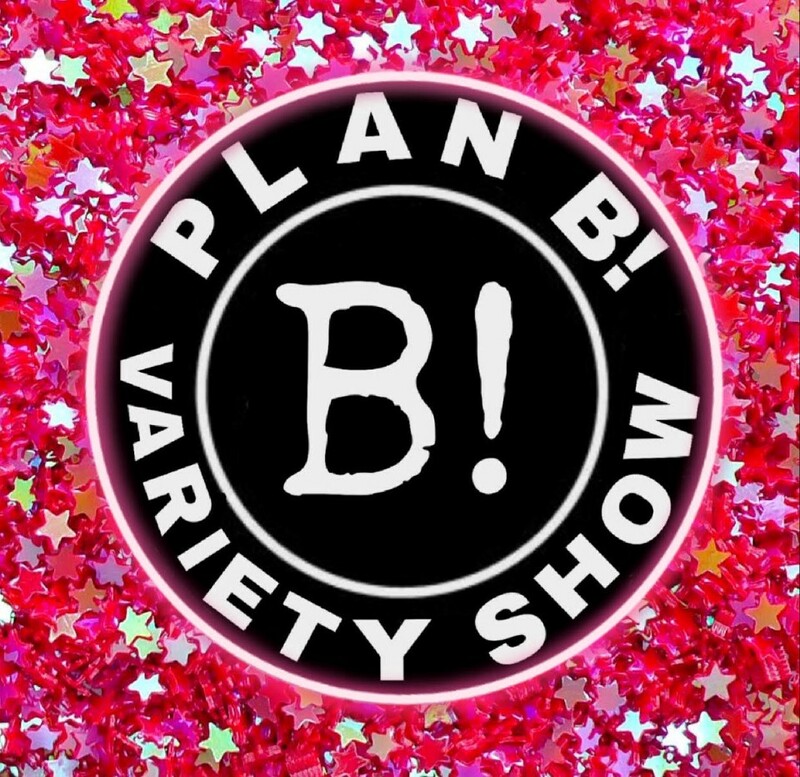 SG: What can an audience member expect from a night at “Plan B!”? SC & SS: Plan B! is truly a variety show. Audience members can expect anything from burlesque, comedy, clowns, live music, participatory games, contests, raffles, and even aerial performers! We strive to bring the best performers to our show and love to surprise and excite our audience. SG: Why was it important to you to have a variety show hosted and curated by women? SC & SS: Our urge to “do better” was a direct result of working with male producers who did the bare minimum for their performers. We hope to not only put on a fantastic show and raise money for worthwhile causes, but to create an environment where performers feel supported and respected. If your annual poker game is scheduled for the third Monday of the month, there are plenty of other variety shows in the neighborhood to choose from. “Am I Write, Ladies” and “Queers n Peers” take place monthly, and similar to “Plan B!” they host an array of artists and genres. 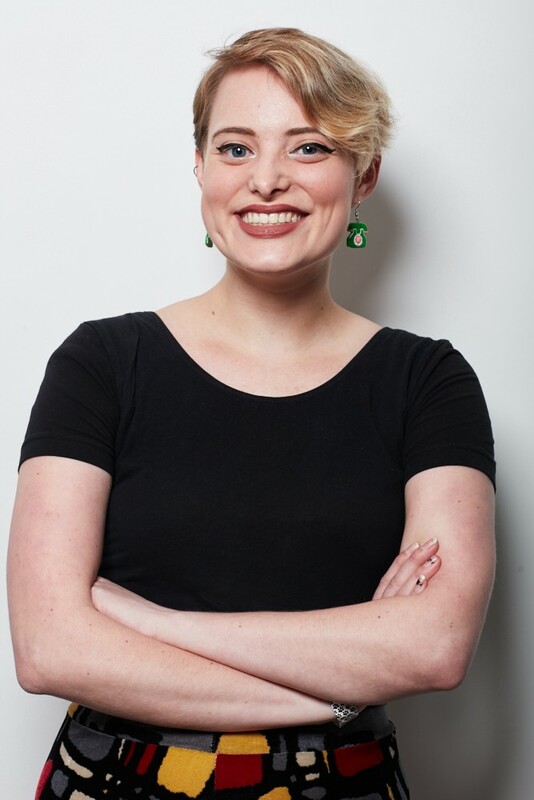 I spoke with Cassidy Dawn Graves, an NYU graduate and Bushwick resident who co-hosts the events. Sarah Galante: Why did you start these shows? When? How? Cassidy Dawn Graves: In college I was very into being involved with a ton of things all the time in every which way, so when I was staying in the city for the summer during my sophomore year in 2014 I met up with a group of theater students who were also staying in the city to brainstorm stuff to do. For some reason I had thought of the title “Am I Write, Ladies?” and liked it, so I proposed a showcase of new writing by women. It was mostly plays, with a couple pieces of poetry and performance art mixed in. I decided I wanted to keep doing the show, and made some changes — expanded the scope to include not just women but non-binary, trans, and gender non-conforming artists; started curating the show through an open call for submissions; brought my friend Nikki Vega on as co-host; and began welcoming all types of art and performance including visual art, not just writing. Four years later, it’s still going strong and I have a new cohost and co-producer, Sammi Miller, who is great. Queers N Peers was started a couple years after AIWL, in 2016. I was becoming more familiar with the comedy scene and noticed how many shows people were doing on a regular basis, so I figured another one would be a decent idea. It started out as Pairs N Pears, with performer Stephanie Guedalia as my cohost, and we would book pairs of performers in different disciplines (two comedians, two musicians, etc), give them pears at the show, and donate any money we made to a pair of organizations monthly. It was around the time of the 2016 election and it felt more important to be giving money to social and economic justice causes than ourselves. About a year later I got a new cohost, actor and burlesque performer Jessy Yates, and we renamed it Pairs N Chairs (Jessy uses a wheelchair). About six months later Jessy went to Yale to get her MFA in Acting, and the show got another name and cohost: my longtime friend and leftist, non-binary drag performer Comrade Barbie, and it’s now called Queers N Peers, since we’re both queer and have a tendency to book queer artists. It’s still a benefit variety show benefitting two organizations a month. SG: Why is it important to you to have a femme and queer-centric performance space? CDG: Firstly, it’s important to not just zero in on women and queer people as important people to provide space and platforms for; people of color, trans people, and disabled people should also be prioritized. I would like my shows to be places where people can show their work (and get paid when possible), find new collaborators, make friends, and gauge the scope of engaging art that is happening in the city, especially from new and emerging artists. It can be hard to find all of that if you’re a marginalized person performing or even being an audience member in a space that’s mostly, say, cis men. I still often see lineups of all sorts that are primarily cis, straight, white, and male, and it’s really on producers and curators to be very intentional in their booking process to prioritize diversity; even if you have a cis white friend who is great and would totally do the show, maybe wait until next month to book them and save that slot for another performer. It can be more work, but it’s work that’s worth doing. SG: Your shows are often hosted in the Bushwick and Ridgewood area. Is there a reason you’ve brought them to these neighborhoods? CDG: I’ve lived in Bushwick for the past four years, and it’s obviously easier to do regular shows at places that are only a short walk or train ride away. It’s also an area with a lot of bars and venues that are willing to give you free space to do shows, and since I’ve been living and going out in the area for a while (it’s where I predominantly started seeing the types of shows that influence what I do now), I’ve gotten more familiar with the venues. Oftentimes friends and collaborators also live nearby, which helps as well. I’ve been lucky enough to find consistent homes for both my shows for the past year or so (QNP at Pine Box Rock Shop; AIWL at The Footlight), which has been nice because you have one less thing to worry about logistically. SG: When is your next show? How can we get tickets? CDG: The next Queers N Peers is January 28 at Pine Box Rock Shop in Bushwick at 9pm ($5–10 suggested donation). The next Am I Write, Ladies? is March 5 at The Footlight at 9pm ($10). For QNP, you pay at the door; for AIWL, you can buy advance tickets on our Withfriends page (a crowdfunding site where people can donate to a fund to pay our artists more) starting a few weeks before the show or with cash at the door. These hosts and curators are creating performance events that are affordable, compelling and meaningful — and just steps away from L/M/J subway lines. “Am I Write Ladies?”, “Queers n Peers”* and “Plan B!” *take place every month, and are a great alternative to a night of Netflix-watching. What are your favorite shows to catch in the city? Let us know by tweeting us @nooklyn, reaching out on Facebook, or finding us on Instagram @nooklyn.stories!